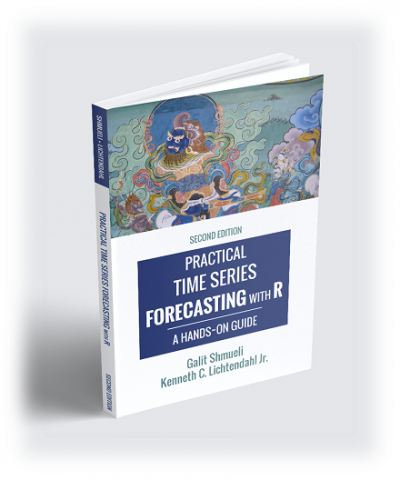 With the recent launch of Amazon Forecast, I can no longer procrastinate writing about forecasting “at scale”! Why the difference? Because the goal is different! Statistical models such as ARIMA and all its econ flavors are often used for parameter estimation or statistical inference. Those are descriptive goals (e.g., “is this series a random walk?”, “what is the volatility of the errors?”). The spectral approach by electrical engineers is often used for the descriptive goals of characterizing a series’ frequencies (signal processing), or for anomaly detection. In contrast, the business applications are strictly predictive: they want forecasts of future values. The simplest methods in terms of ease-of-use, computation, software availability, and understanding, are linear regression models and exponential smoothing. And those methods provide sufficiently accurate forecasts in many applications – hence their popularity! In my course “Business Anlaytics Using Forecasting” at NTHU this year, teams have experienced trying to forecast hundreds of series from a company we’re collaborating with. They used various approaches and tools. The excellent forecast package in R by Rob Hyndman’s team includes automated functions for ARIMA (auto.arima), exponential smoothing (ets), and a single-layer neural net (nnetar). Facebook’s prophet algorithm (and R package) runs a linear regression. Some of these methods are computationally heavier (e.g. ARIMA) so implementation matters. 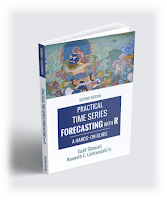 While everyone gets excited about complex methods, in time series so far evidence is that “simple is king”: naive forecasts are often hard to beat! In the recent M4 forecasting contest (with 100,000 series), what seemed to work well were combinations (ensembles) of standard forecasting methods such as exponential smoothing and ARIMA combined using a machine learning method for the ensemble weights. Machine learning algorithms were far inferior. The secret sauce is ensembles. Forecasting is experiencing a new “split personality” phase, of small-scale tailored forecasting applications that integrate domain knowledge vs. large-scale applications that rely on automated “mass-production” forecasting. My prediction is that these two types of problems will continue to survive and thrive, requiring different types of modeling and different skills by the modelers.